Remind yourself or someone else of the promise you intend to keep with this lovely 10k white gold diamond ring from the True Promise Collection. The centerpiece features 9 invisible set princess diamonds framed within intricate milgrain detailing. Additional round diamonds and milgrain details adorn the shoulders of the band for a breathtaking design. Diamonds are 1/6ctw, I or better in color, and I2 in clarity. Metal: 10k White GoldWhite Gold: A white colored gold attained by alloying yellow gold, copper, nickel and zinc, then plating the resulting alloy with rhodium. Total Diamond Weight: 1/6 ctwCarat Weight: The actual weight of a single gemstone. The weight of a one carat diamond equates to 200 mg or 0.2 grams. Carat weight is often expressed as a decimal or as points. A one carat diamond is the same as 1ct. or 100 points; a 1/2 carat diamond could also be called .5ct. 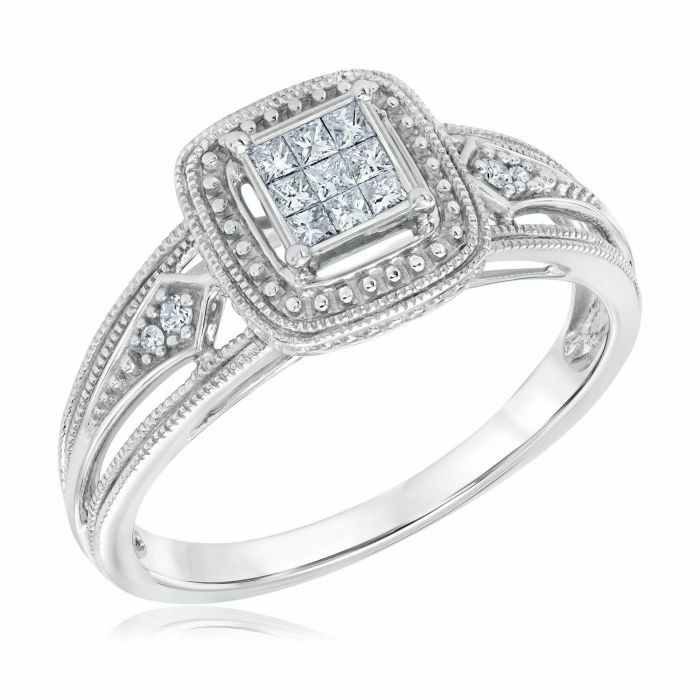 or a 50 point diamond. To make things complicated, gemstones have different densities. Meaning, a one carat diamond and a one carat amethyst are not exactly the same size. See our Education section regarding the "4 C's" for detailed information regarding Carat Weight.